A confident and elegant exterior design exudes strength from every angle. 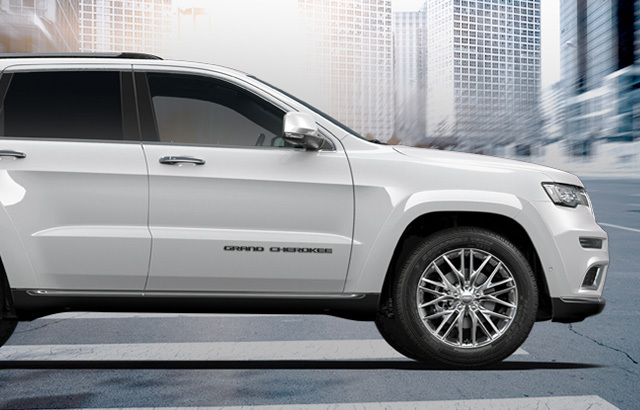 For 2017, Grand Cherokee comes with a new look, featuring premium styling treatments including a new front grille and fascia, new wheel design and fog led lamps. 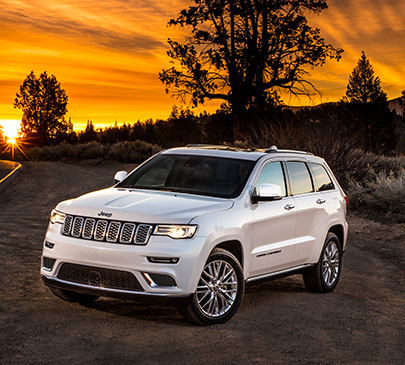 In 2017 Jeep® welcomes the all-new Jeep® Grand Cherokee Trailhawk® model. Imagine having to handle the most challenging driving conditions without leaving behind comfort, style and premiumness. In 2017, this will be possible thanks to the new Jeep® Grand Cherokee Summit with new levels of exclusivity and craftsmanship. The new Summit model interior is topped with a soft suede-like headliner for a deluxe finish, quilted bolsters with contrast piping highlight the soft, supple optional Laguna leather-trimmed interior. Gloss, real wood accents add warmth and style to the sumptuous and inviting interior. The exceptional eight-speed automatic transmission provides quick acceleration and smooth shifting. Engage the new slapstick shifter into Sport or Drive Mode and you have full control of the upshifts with the steering wheel-mounted paddle shifter controls. It also allows for a crawl ratio of 44.1:1 to aid in off-roading (when equipped with a two-speed transfer case). Legendary Jeep® vehicle capability improves with the Selec-Terrain® traction control system, giving you five modes to tackle almost any condition including snow. Traction is also enhanced through the available Quadra-Trac II® or Quadra-Drive® II 4WD systems. The available Quadra-Lift® air suspension system features five height settings for optimum ride performance. The 3.0L TurboDiesel V6 engine delivers clean-diesel technology with low CO2 emissions. The clean and refined powertrain helps deliver optimum fuel economy with awe-inspiring performance. Combined with the advanced eight-speed automatic transmission, the 2017 Jeep® Grand Cherokee can tow up to 3,500 kgs (7,400 lbs) so now you can tow almost all your belongings to wherever you nomadic heart desires.